Home/Knowledge Base/Email/How to add a domain forwarder? How to add a domain forwarder? 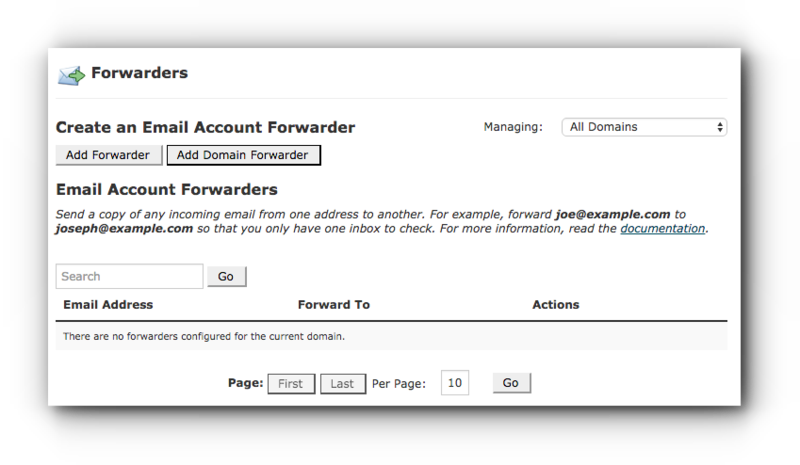 Domain forwarder allows you to forward all emails from your domain name to the main email account (default email address) of the other domain. To add a domain forwarder, please follow the instructions below. Step 2. Click on Forwarders under Email panel. Step 3. In the Forwarders page, click on Add Domain Forwarder button. Step 4. Under the domain portion, you can choose what domain name you want to forward emails from (in case you have more than 1 domain name). Type in the other domain name you want the emails to be forwarded to in the empty field. In the example we have the domain is testdomain.com and the receiving domain is anotherdomain.com. The email account that will receive the forwarded emails is the default email account of the domain name; example for that would be main@anotherdomain.com. You may need to check the cPanel of anotherdomain.com to see what the default email account is. Step 5. Click Add Domain Forwarder button to save the changes. You may encounter errors in setting up a forwarding. This can be because you are forwarding it to an external domain name. Please take time to read the email forwarding limitations.